Navigate: StoreFront / Food, Sweets and Beverages / Chips, Jerky and Snacks / Buffalo Dill Limited-Edition Jerky by Louisville Jerky Co.
Buffalo Dill Limited-Edition Jerky by Louisville Jerky Co. 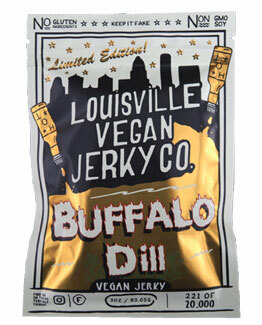 This tasty new limited-edition vegna jerky flavor by the talented folks at Louisville Vegan Jerky Co. combines buttery buffalo-style spicy jerky and gives it the perfect hint of garlic, dill and onion for a truly unique flavor combination. Made with non-GMO soy, it's also gluten-free and 100% delicious - get your package before this flavor disappears as it won't be around for long! 3 oz. (85g) package is $6.99.